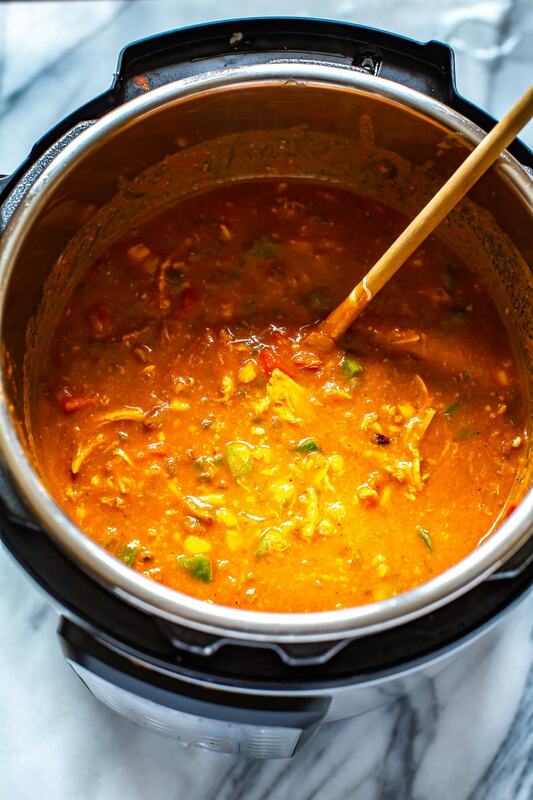 This Instant Pot Chicken Enchilada Soup is a delicious copycat of Chili's enchilada soup recipe. It's made healthier and easily using pantry staples! You'll love this Mexican soup! 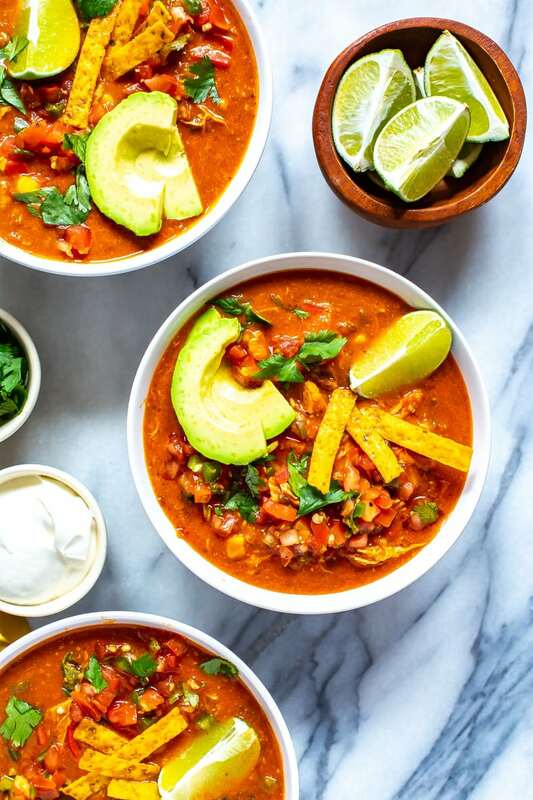 As far as Instant Pot recipes are concerned, this chicken enchilada soup covers all of the “easy weeknight dinner” bases. The soup freezes well, so it's the perfect meal prep recipe. It's made using simple pantry staples, most of which you may already have on hand. 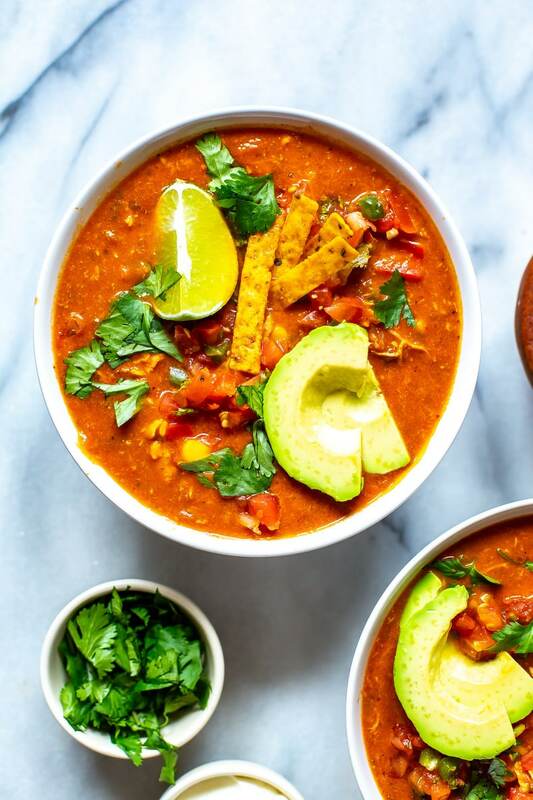 The recipe ingredients are good for you, so this enchilada soup recipe is healthier than Chili's chicken enchilada soup recipe. Can you make this Instant Pot soup recipe in a slow cooker? With the exception of toppings, place all of the soup ingredients into a slow cooker, in the order shown below. Stir the ingredients to combine. Then, cook on low power for 8 hours or on high power for 4 to 6 hours. Be sure to use a food thermometer to check the chicken for doneness. When it’s properly cooked, the internal temperature of chicken breasts is 165 degrees F., or 73.8 Celsius. 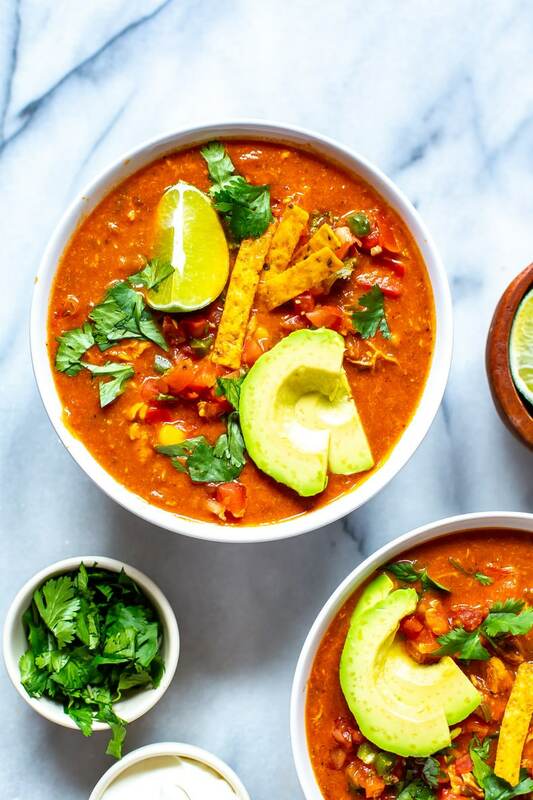 Is chicken enchilada soup healthy? This Instant Pot soup is pretty healthy, especially in comparison to other versions of the recipe. For instance, Chili’s chicken enchilada soup has cream cheese in it. Our recipe doesn’t call for any cream cheese. On average, omitting cream cheese saves 100 calories and several grams of fat per serving. That being said, our recipe calls for 1/2 cup of sour cream. To keep the Instant Pot soup low in calories, you can use low-fat or non-fat sour cream. 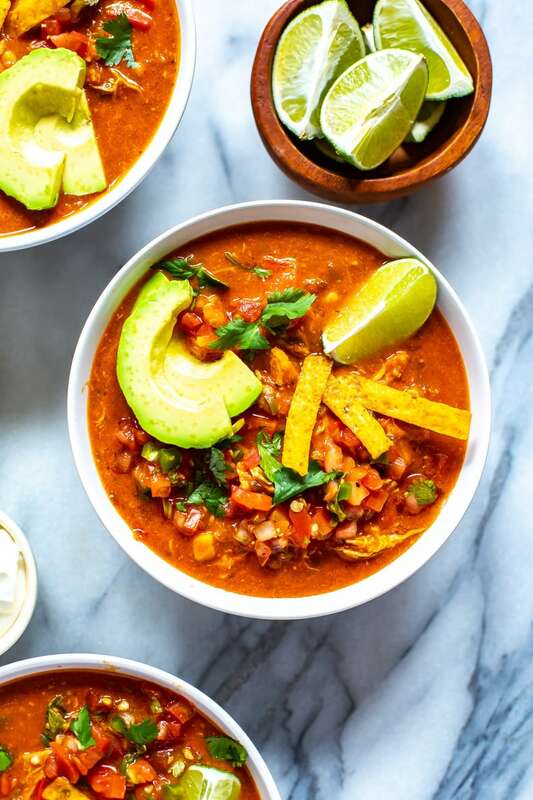 Another reason that this chicken enchilada soup recipe is healthier than most is that we don’t use canned enchilada sauce. Canned sauces often have high levels of sodium and artificial ingredients in them. Instead, we use diced tomatoes combined with some spices to create homemade enchilada sauce. Use low-fat or non-fat cheese and sour cream, or omit them completely. Omit the garnish of tortilla strips, or use them in moderation. For a boost of soluble fiber and protein, add some cooked black beans to the soup. Is this Instant Pot soup gluten-free? As written, our soup recipe is gluten-free. If you plan to use canned enchilada sauce, be sure to check the ingredients to assure that it is gluten-free. What kind of chicken is in chicken enchilada soup? When I make pressure cooker chicken enchilada soup, I use chicken breasts. If you prefer dark meat chicken, you can make the recipe using boneless skinless chicken thighs. Can you freeze enchilada soup? Without garnishes, this soup freezes beautifully. 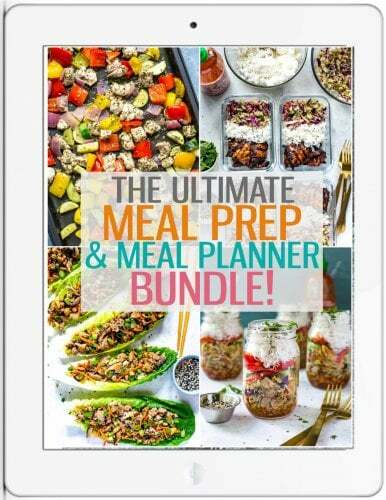 As a result, it’s a fantastic meal prep recipe! Before freezing the soup, be sure that it is completely cool. After it is cool, transfer the soup into freeable meal prep containers. Alternatively, freeze the soup in gallon-sized Ziploc storage bags. Important note: Do not completely fill the bags to the top with soup. This is because soup expands as it freezes. To allow for expansion, just leave a 1-inch space at the top of the bag. 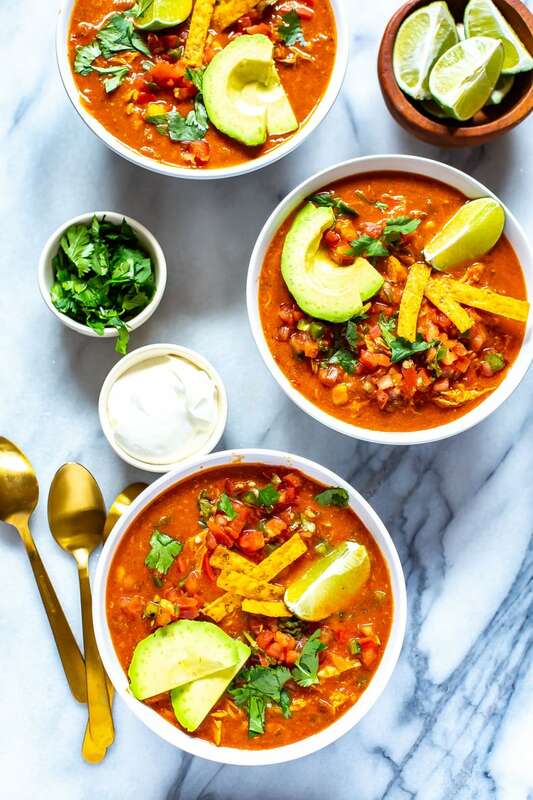 Grab some glass meal prep bowls if you plan on making the enchilada soup for your weekly lunches. 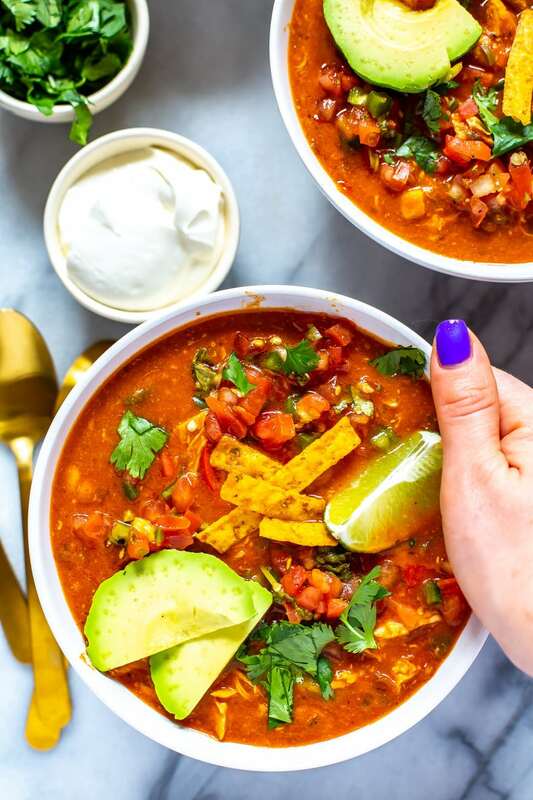 This Instant Pot Chicken Enchilada Soup is a delicious copycat of the Chili's enchilada soup recipe made healthier and with pantry staples! You'll love this Mexican soup! 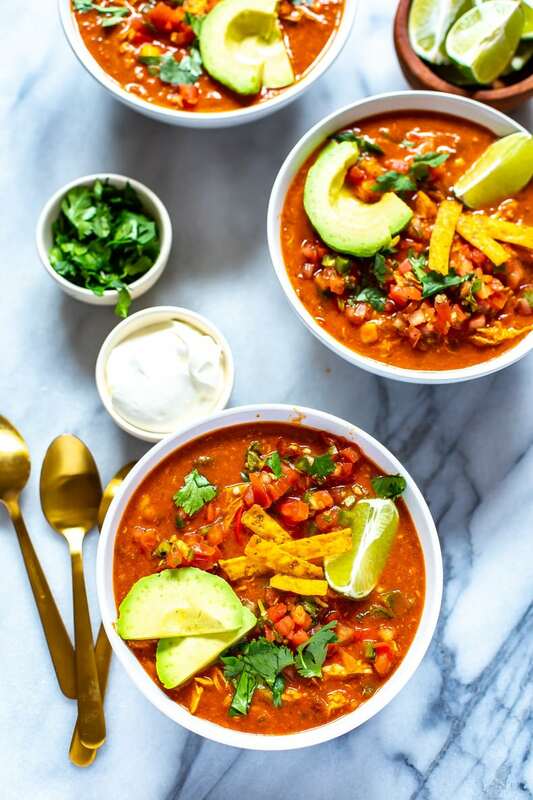 Add all ingredients to Instant Pot in order that they appear listed above except for sour cream, cheddar cheese and bell peppers. Place lid on Instant Pot and make sure valve is set to seal. Press the pressure cook button and set to high, then cook for 5 minutes. Instant Pot will take about 10 to 15 minutes to come to pressure then pressure cook the 5 minutes. Meanwhile, get toppings ready. Do a quick release of the pressure by flicking the switch at the top with a spoon, then open lid when pressure gauge has dropped and lid opens easily. Remove the chicken, shred it, then add it back to the pot and stir in sour cream, cheddar cheese, lime juice and bell peppers. Replace lid on Instant Pot and let sit for 5 minutes. Serve and add toppings of your choice. Enjoy! Tried this on Friday, really liked it. I’m surprised at the low carb count. Just wondering the methodology for reaching the protein/carb/fat numbers? I count macros for diet and need to be accurate, sorry. Thank you for the recipe! So glad you liked it! 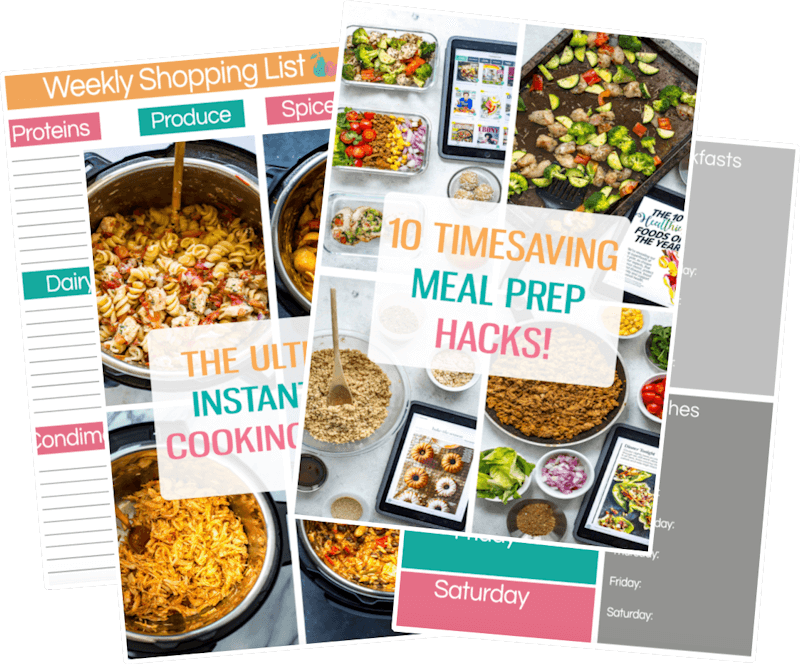 Unfortunately I can’t provide detailed macro counts – if you’d like more detailed nutritional info you can plug the ingredients in to a fitness/calorie counting app.